It doesn't need to be spring to do a little spring cleaning! Before hunkering down out of the cold, tidy up and organize to start relaxing for the winter. Here are a few tips to getting everything in order and begin winter nesting. Low on closet space? Go through and sort clothing. Chances are, sandals, shorts, and tank tops won't be needed at Christmastime. Get some plastic bins or moving boxes to pack all of your summertime clothing away. Once that warm weather wardrobe is out of your closet, the available space should double. 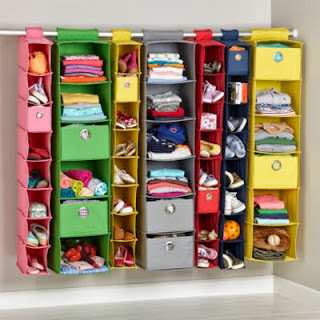 Organize the remaining items with closet organizers, like shelves, a shoe rack, or a closet doubler. Closet organizers perfect for saving room. Find these at LandOfNod.com. While going through clothing, and anything else in the house, for that matter, this makes it much easier to decide what to do with it all. Make three piles, KEEP, DONATE, and TRASH. Having a goal in mind while sorting will make it easier to get started and help speed up the process. If you're still having a hard time deciding which pile a pair of shoes should go into, follow this one simple rule. Think back over the last year. Did you wear the shoes at least once in the last twelve months? If not, donate them! There's another way to keep this rule all year long with clothing on hangers. At the beginning of the year, hang up everything with the hangers facing all one direction. When you wear and item and put it back in the closet, flip the hanger around the other way! At the end of the year, you can easily see which items have been used and worn, and which ones weren't touched. Make your way into the kitchen, because it's time to clean out all of that food that has been collecting in the back of the cupboard. Go through and check dates, and throw away any cans that are dented or bulging. These are signs of contamination and spoiled food. This is caused by the bacteria Clostridium botulinum, which causes botulism, a very serious illness. Plus, anyone who has experienced food poisoning knows it's not even worth getting a day off of work! Visit the FDA website for more information about spoiled canned food, how to identify it, and more. Also consider putting organizers into drawers in the kitchen and bathroom. There isn't any reason why that classic junk drawer can't also be clean and organized. Having organizers in drawers creates a specific place or home for items, making it easier to put them away in the correct spot after using them. Is the kids' play room a disaster? Peter Walsh on Oprah.com gave some great tips to keep the kids' rooms clean and organized. First, he says to ask the kids to pick five toys that are their favorite, and five that they don't play with much to donate to the less fortunate. Another tip he gave was to go through the toys and toss or donate any toys that aren't played with as much. It's likely the kids won't even notice they're gone. And lastly, his advice was to get some bins so sort toys into, and then label. Some examples are bins for Barbies, action figures, farm animals, Lincoln Logs, etc. This not only gives a home to each toy, but also makes it easy for the kids to clean up after themselves, and teaches them good organization skills early on. Don't forget about the car! Summer brings a lot of dirt and sand, which usually ends up in the car, along with tons of road trip items and trash that were left behind. Take care of all of this in one go. Find a car wash with a vacuum and trash bin. Toss the garbage and vacuum the carpets all at the same time. This also forces you to decide which items to take into the house or leave in the car. Try to leave an extra blanket, some emergency food kits, and a first aid kit in the car, especially in areas that get a lot of snow. You never know when you might get stuck in your car. And lastly, what to do with all of those bins mentioned above. Store them in the garage or shed. Large plastic bins are easy to store and stack. Put them along walls or up in the rafters. This is the perfect place for seasonal items, like your out of season clothing, holiday decorations, or kid and baby items to save for later.